With a host of outstanding new design features the Bavaria 46 has been carefully developed to provide even better cruising. A new and creative interior gives a more spacious and lighter ambience in the accommodations whilst the exterior is designed for practical sailing on deck. 25% DISCOUNT APPLIES FOR LAST MINUTE BOOKINGS. 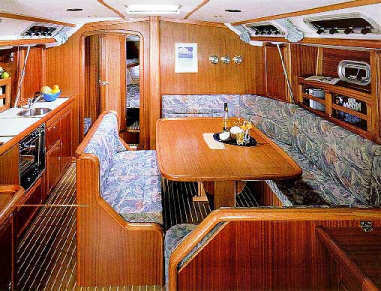 The Bavaria 46 can sleep eight people in four private cabins. Aft, there are two large double cabins. Forward, there are two twin bunk cabins. 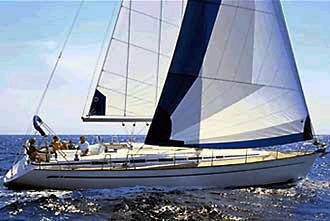 In total the Bavaria 46 has two heads, both with hot and cold showers. The Bavaria 46 has furling mainsail and genoa, roller reefing, wheel steering, electric anchor winch, GPS, autopilot, depth sounder and VHF radio. 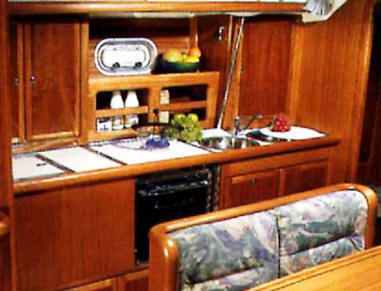 There is swimming platform and ladder, a bimini and dodger shading the companionway, an ondeck shower, CD player, fully equipped galley with gas stove & oven and electric fridge/freezer. Optionals include a skipper or hostess and a provisioning service.